In large bowl, mix mashed potatoes, cheese, 2 tablespoons of the chives, the bacon and 1 of the eggs with spoon until blended. Shape mixture into 1-inch balls. In shallow bowl, place bread crumbs. In another shallow bowl, beat remaining 5 eggs. Coat potato balls with bread crumbs, then dip into eggs and coat again with bread crumbs. In deep fryer or 3-quart heavy saucepan, heat 2 inches oil to 375°F. Fry potato balls, in batches, in hot oil 1 minute to 1 minute 30 seconds or until golden brown. Drain on paper towels. In small bowl, mix sour cream, remaining 2 tablespoons chives and the dressing mix. Serve warm potato bites with sauce. Get all the flavors of a loaded baked potato in one mouthful. 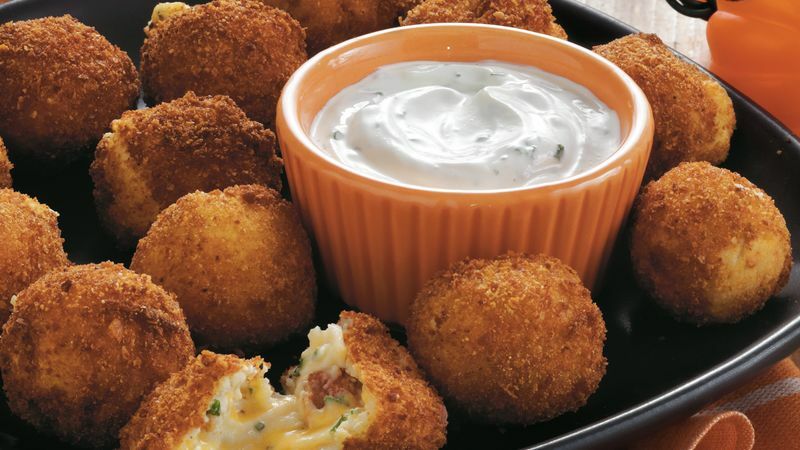 These fried mashed potato balls are best served hot while the cheesy center is freshly melted.